Can a 'Loyalty Oath' Ensure the Allegiance of Afghans? 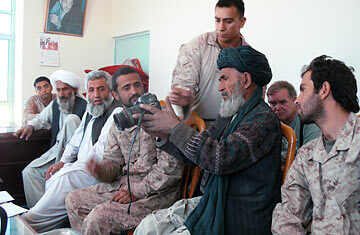 A Marine handed his bulky digital camera to Haji Assidullah. Earlier this month, Lieut. Colonel William F. McCullough, commanding officer of the 1-5 U.S. Marines in Afghanistan's Helmand province, took part in an exercise in insurgent reintegration. He rose from a dusty couch and extended his hand to one Abdul Khalik, whom his men had detained for the previous three days on suspicion of insurgent activities. "What do you want him to do now," asked McCullough's translator. "Anything he wants," said McCullough, taking Khalik's hand and shaking it, "so long as he supports us and our government." Khalik had just finished inking his thumbprint onto a "Reintegration Agreement," which had been provided by McCullough and the local District Governor, Abdul Manaf, in whose fortified, shabby office we sat. The agreement, which Manaf had read aloud on account of Khalik's illiteracy, was printed in English and Pashtu. "I, _______ hereby publicly pledge my support for the Government of the Islamic Republic of Afghanistan (GIRoA). I renounce the actions of the Taliban and other groups that seek to undermine GIRoA or harm either the Afghan National Security Forces (ANSF) or the International Security Assistance Force (ISAF). I pledge to provide no support for the enemies of GIRoA and will inform GIRoA, ANSF, or ISAF officials anytime I have information concerning Taliban or criminal activities. I agree to never again raise arms against my Government and will work towards building a peaceful community. I voluntarily submit my biometric data with the understanding that it can be used to identify and prosecute me if I break this solemn pledge. I make this pledge on my honor and also that of my sponsor." Khalik, dusty in a torn shalwar kameez, looked relieved as McCullough released his ink stained hand. His village elder, a long gray-bearded man named Haji Assidullah  who had just signed the corollary "Reintegration Sponsor Agreement"  gave him a reassuring smile. A Marine took Khalik from the room and then walked outside to retrieve another detainee, to repeat the process. Three days before, according to McCullough, Khalik had been among several Afghans caught in the middle of a Taliban attack on a U.S. battalion's foot patrols, on the road between the Helmand villages of Bagrabat and Hazarapas. "My men were walking on the road," he told Haji Assidullah and his fellow elder Jon Mohammed. "The car with these men [the detainees] sped up, drove right at them, didn't stop, almost hit two of my men, then the car behind that one stopped. Three men got out and started firing at my men. Two others on the side of the road with RPGs didn't get them off in time, because we fired at them." "Where are those five men?" asked Jon Mohammed. "Some of them are dead," McCullough said. "We don't collect the dead." "If you shot them, they should have weapons. Where are the weapons?" This conversation was cut short by a Marine arriving with a camera to show the elders pictures of other candidates for reintegration. The contradiction about such candidates, like Khalik, is that the Marines would not release them if there was evidence linking them to an attack. So ostensibly, there is no need to "reintegrate" them at all. But the "re-integration agreement," which also contains a clause in which the signatory volunteers his biometric data, is part of the Afghan government's attempt to reconcile with the forces inimical to it. McCullough said that supporting the Afghan government was paramount to his mission. But the reintegration forms, he explained later, "are not us, they are GIRoA. We helped them clean it up, gave them ideas, used our computers." Taliban reconciliation is not a new idea. The notion of reconciling so called "little-t Taliban" as opposed to "big-T Taliban" is a common talking point among even enlisted Marines in Helmand province. In August of this year, General Stanley McChrystal recruited the U.K.'s former Director of Special Forces, Sir Graeme Lamb, to work on what General David Petraeus called "local level reconciliation and reintegration." But documents cited by the BBC this week recommended that attempts to reconcile be made at the "operational" and "strategic" levels  not just with foot soldiers, but with leadership as well. One wonders what such a process would look like, given how the Marines' reintegration procedure works at the foot soldier level. Many, if not most, of the Afghans involved were illiterate, and accustomed to making agreements not rapidly, on chairs, with a relatively new governor, but over time, on cushions, along older networks. As the translators filled in the blanks on the agreements ("Subject's name; Reintegration tracking #"), McCullough questioned the other elder village Jon Mohammed about some of the detainees who had been taken into custody at a house not far from the attack. "What were your people doing down in that house?" McCullough asked. "They were visiting friends, just eating," replied Jon Mohammed. "Some of the people they were visiting are criminals." "So I am going to ask you a favor," said McCullough, leaning forward. "You have to tell your guys to be very careful about who they are friends with." Jon Mohammed gesticulated vigorously to the translator in response. "My government has invited you here, and when you do these things we are very upset. If you find people who are doing these things, IEDs, bring them before me and I will be happy to have their heads cut off. You are here to protect the country." "If we find these guys with criminals again, I will be less inclined to hand them over to you," said McCullough, evenly. McCullough is boyish and blond. His acid blue eyes and commanding tone offset his somewhat delicate physical presence. He is a thoughtful officer, beloved by the Marines he led through fierce fighting as they established themselves in Helmand this summer. After the last of the detainees had made their mark, and the elders had departed, McCullough and I stood in the hallway outside Governor Manaf's office. McCullough had a lot to do that day  his Marines were trying to maintain security, rebuild bridges, solve the riddles of the local canal networks, and so on. But before he went on to his next meeting, I asked him what he would have done if one of the detainees had refused to sign the document. He responded unequivocally: "We would've convinced them to sign." See one photographer's journey through the war in Afghanistan.